The government-owned Ethiopian Airlines (www.ethiopianairlines.com) offers Addis Ababa flights direct to/from Washington D.C., Newark, Los Angeles, and Toronto. Visas can be obtained at the Bole International Airport in Addis Ababa upon arrival, but this should only be used as a last resort; it is much better to secure these before the trip. In addition to passport and visa, a WHO confirmation of yellow fever and polio vaccinations is required for entry. Clients should also be advised that it is illegal to take pictures of government buildings, police and military personnel, and infrastructure including bridges and dams - rule of thumb should be to consult the tour guide when in doubt. Ethiopia’s capital city Addis Ababa sits in the center of the country and has the country’s largest international airport, making it the logical starting place for a visit. The National Museum of Ethiopia here houses the fossilized remains of the famous Lucy, a 3.1 million year-old hominid specimen, as well as Ethiopian artwork and religious relics. Addis Ababa also has Africa’s largest market, the Merkato, and several historic churches including the Holy Trinity Cathedral. The capital’s art scene is growing rapidly with several museums like the Gebre Kristos Desta Museum and the Zoma Contemporary Arts Center, as well as the opening of galleries including the popular Makush Art Gallery, which offers the works of 70 Ethiopian painters. Advise clients interested in the local music scene to ask their concierge where they can hear acts like Jano Band play the new music dubbed “Ethio-Rock”, a mix of Ethiopian and rock music. The African Jazz Village, a music school and jazz club dedicated to promoting Ethio-jazz, is a place to look for performances as well. Due to its higher elevation, temperatures here are comfortable year-round, although the long dry season from November through February is considered the best time to visit. The city of Bahir Dar sits on the southern shore of Lake Tana and near the spectacular Tisisat (Blue Nile) Falls, making it a popular place to stay while enjoying these sights as well as excursions to Gondar and the Simien Mountains National Park. Lake Tana is the country’s largest body of water and the source of the Blue Nile. Hippopotamuses are a common sight, but the lake is best known for its island monasteries housing ancient religious texts and mummified remains of past emperors. Of the churches open to the public, most do not allow women past the shore, but some attendants will bring relics to show female visitors. Tisisat Falls is located about 25 miles from Bahir Dar, and its continuous spray of mist allows a small rain forest to thrive nearby. 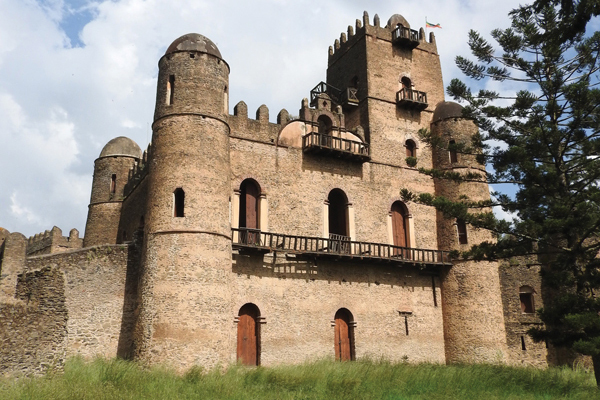 North of Lake Tana, Gondar was once the capital of the Ethiopian Empire and is known as the “Camelot of Africa” because of its many castles. It is the home of Ethiopia’s small Jewish community and a center for skilled artisans known for their work with leather, cloth, and metal. To the northeast, the Simien Mountains National Park is the habitat for several endangered and rare species, including the Ethiopian Wolf and the Walia Ibex. Your clients might also see other species like the Gelada Baboon, commonly found grazing the slopes. The area is a bird-lover’s paradise, and the park was declared a UNESCO World Heritage site in 1978. The Ethiopian Orthodox Church holds that the Arc of the Covenant, the sacred resting place of the Ten Commandments, is housed in the cathedral of St. Mary Zion in the city of Aksum. Aksum has over 130 monoliths, some still standing, each with tombs below them; tourists can also see the ruins of the Queen of Sheba’s palace. The churches at Lalibela are among Ethiopia’s most treasured and unusual sights, often referred to as the “New Jerusalem.” Built in the late 12th and early 13th centuries under the orders of King Lalibela, these eleven churches are monolithic, each a single stone edifice carved from the volcanic rock, complete with windows, doors, stairs, and decorative carvings. Many of these churches are still in use, and several are connected by tunnels. The walled city of Harar is considered one of the holiest Islamic cities, nicknamed “Africa’s Mecca” and designated as a UNESCO World Heritage site in 2006. The city was founded over 1,000 years ago and houses nearly 100 mosques within its 16-foot walls. In addition to rich history and narrow maze-like streets with brightly decorated buildings, visitors will find a unique spectacle just outside the city walls each night: volunteers feed wild hyenas meat from a stick, which they hold in their mouths in a display of unity with the sacred canines. For those who are looking for a more extreme adventure, the Erta Ale volcano in the Danakil Depression is one of the most spectacular sights in the world. Close to the volatile Eritrean border, it is vital to employ a reputable guide who can provide security; just as important is to ensure that travelers are fully prepared to venture into one of the hottest places on the planet. Erta Ale’s lava lake is the longest-existing and only one of six in the world, and is surrounded by hydrothermal fields that leave colorful mineral deposits, making the landscape look more alien than terrestrial. Ethiopian coffee is not only the best in the world, but was also the first. Legend says that the energizing beans were discovered by a goat-herder and accidentally roasted and brewed by Ethiopian monks. Any coffee-lover should seek out a traditional coffee ceremony, or at the very least sample local coffee at every opportunity. For more information, visit the Ethiopian Tourism Organization (www.ethiopia.travel).